The four channel audio installation, which emits its sound on the four sides of the pedestal in the room, envelops the visitor and gives him time to listen and to get lost in the sound waves of the composition. The music, based on the bells of the cathedral, refers to the moment of silence. The installation ((Bells Breath)) sees itself as a contemporary work in the church. The installation can be heard in the Tower Hall of Ulm Cathedral from 10th October to 18th November 2015th. Now to the actual project. The composition is to be released on a record. The stereo mix of the sound installation and 3 different sound studies which have been produced during the production period are also pressed on the record. Everything is also made available for downloading. Die vier Kanalige Audioinstallation, welche ihren Klang über die vier Seitenteile des Podestes in den Raum abgibt, hüllt den Besucher ein und gibt ihm Zeit, zuzuhören und sich in den Schallwellen der Komposition zu verlieren. Die Musik, auf Basis der Glocken des Münsters, bezieht sich auf den Moment der Stille. Die Installation ((Bells Breath)) versteht sich als eine zeitgenössische Arbeit im Kirchenraum. Die Installation ist vom 10.Oktober bis 18.November 2015 in der Turmhalle des Ulmer Münster zu hören. Die Komposition soll auf einer Schallplatte veröffentlicht werden. Die Stereomischung aus der Klanginstallation und 3 verschiedener Klangstudien, welche während der Produktionszeit hergestellt wurden, werden ebenfalls auf die Schallplatte gepresst. Alles wird ebenso als Download zur Verfügung gestellt. In the event that the LP lack of funding is not established, an alternative is a digital file as Download from our website (www.bellsbreath.de) available. Download auf unserer Webseite (www.bellsbreath.de) zur Verfügung. at Lancaster Institute for the Contemporary Arts, Lancaster University, November 13th 2015, 10-7. This symposium explores the practice, influence and prominence of women in Sound. It also addresses the wider role of women in Sound by supporting those who work in the field and giving voice to those who have contributed historically. The symposium is accepting abstract submissions for paper presentations and sound installations. For more information go to http://lindaokeeffe.com/blog/?p=224. Presentations will be documented in an open report for the Interference Journal: A Journal of Audio Cultures. Please email submissions to Linda at l.okeeffe@lancaster.ac.uk. Deadline is 1st October. Submission open to all genders. Tea/coffee and lunch will be provided for participants. 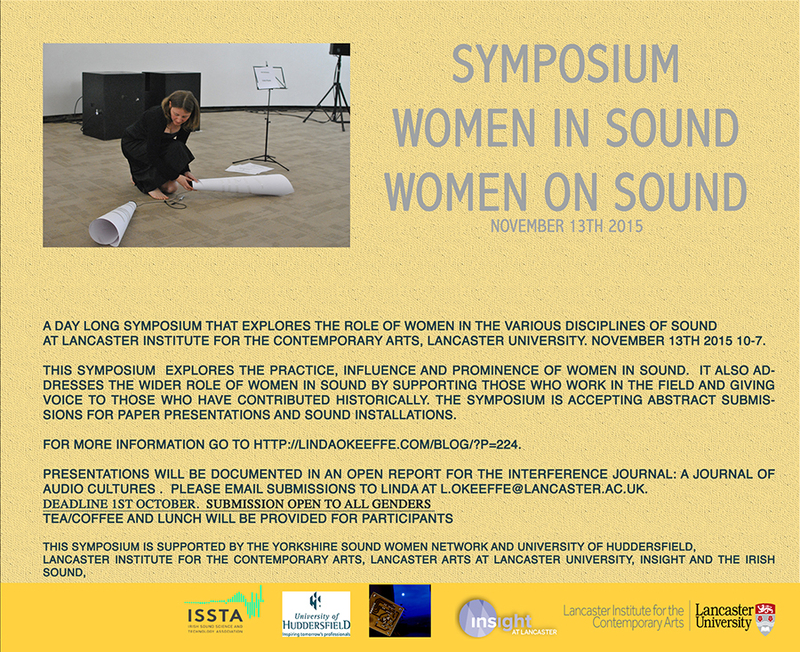 This symposium is supported by Yorkshire Sound Women Network and University of Huddersfield, Lancaster Institute for the Contemporary Arts, Lancaster Arts at Lancaster University, Insight, and the Irish Sound, Science and Technology Association. Demostració de l’Aquòfon, un curiós instrument que crea música amb gotes d’aigua! Amb motiu del Dia Mundial de l’Escolta, el proper Dissabte 18 de juliol, el Museu de les Idees i Invents de Barcelona (miba) acull una exposició i tallers al voltant d’un aqüòfon, una escultura sonora que crea música mitjançant la percussió de gotes de aigua sobre sensors electrònics. Alguns dels sons creats en aquesta instal·lació només són audibles pels menors de 20 anys, a causa del fenomen de la presbiacúsia, la impossibilitat d’escoltar freqüències ? ?altes a partir de certa edat. D’aquesta manera, l’experiència sensorial d’aquesta acció musical és diferent per a cada franja d’edat. L’invent, creat per Patxi Valera i LARLegido, aplica la tècnica pictòrica del dripping o degoteig controlat al medi musical a partir d’ampolles de sèrum fisiològic que degoten a diferents ritmes. Aquestes gotes activen unes pastilles electròniques que generen una àmplia gamma de sons musicals a temps real. L’exposició, que es podrà visitar exclusivament aquest cap de setmana, vol commemorar el Dia Mundial de la Escolta per conscienciar sobre el valor de l’escolta, cridar l’atenció sobre els sons de l’entorn i promoure l’estudi del paisatge sonor. Activitat gratuïta amb l’entrada al miba. 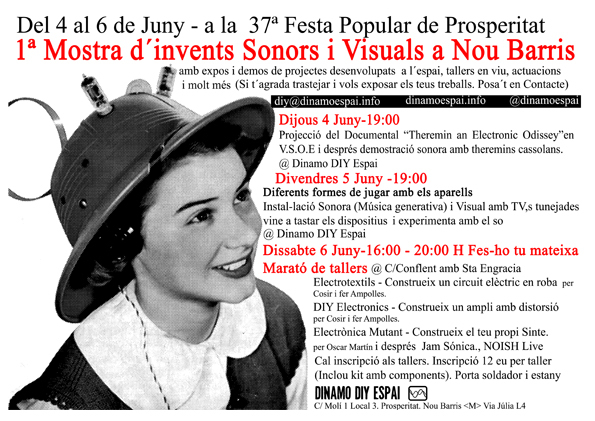 MUESTRA DE INVENTOS SONOROS I VISUALES DE NOU BARRIS. Te invitamos a participar en la 1ª Muestra de Inventos sonoros y Visuales en Nou Barris. Con una extensa colección y gran surtido de dispositivos autoconstruidos en los diferentes talleres que se han ido realizando en el espacio, durante los últimos meses y también con talleres en vivo, audiovisuales, performances, actuaciones y más. Más información en Dinamo DIY Espai.